We are often asked “What about tankless?” Tankless water heaters have been in existence for nearly a century and they are once again becoming a very popular choice here in the U.S. However, for those considering a tankless water heater, there are some differences – both good and bad – that people should be aware of before they make that decision. 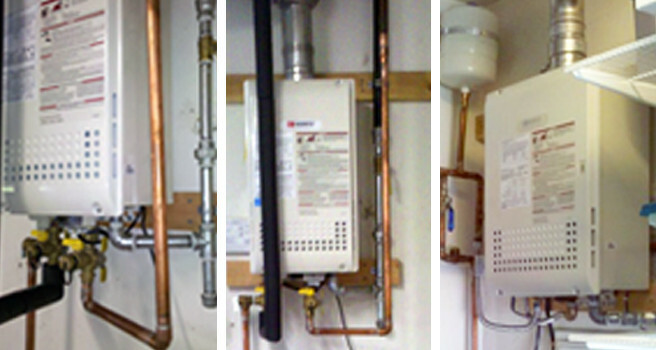 For starters, tankless water heaters work differently than the classic storage tank water heaters. Instead of having to keep 40-50 gallons of water hot, the tankless systems use a small chamber or box that heats the water as it passes through. The water is heated by a large gas burner or by a heat exchanger, which requires more gas or electricity to be used initially, but when the water isn’t being heated, no gas or electricity is used. If you don’t use a lot of hot water at one time and depending on what type of tankless water heater you purchased and if you are able to have one installed relatively easily, then tankless might be a good choice for you. It should be noted, however, that these types of water heaters do cost more upfront, though the energy savings realized over the life of the heater can make it very desirable. Tankless water heaters also don’t take up as much room, so you might be able to free up space. The size also helps if you need the heater in a smaller location that doesn’t provide the clearance that a standard water heater requires. Water Heaters Only, Inc. has experience installing most brands of tankless water heaters and we are available 24 hours a day to answer any questions you might have. Just call us at (619) 222-3814 and let one of water heater experts help you decide whether tankless is the best option for you. Then we can even help set up an appointment to have one of our technicians come out and install your new tankless water heater.